Download "Policy and guidance for dealing with Alcohol and Drug related issues"
1 Policy and guidance for dealing with Alcohol and Drug related issues Introduction 1. In accordance with its mission the University has a duty to provide a safe and healthy working and learning environment for all its employees and students. 2. 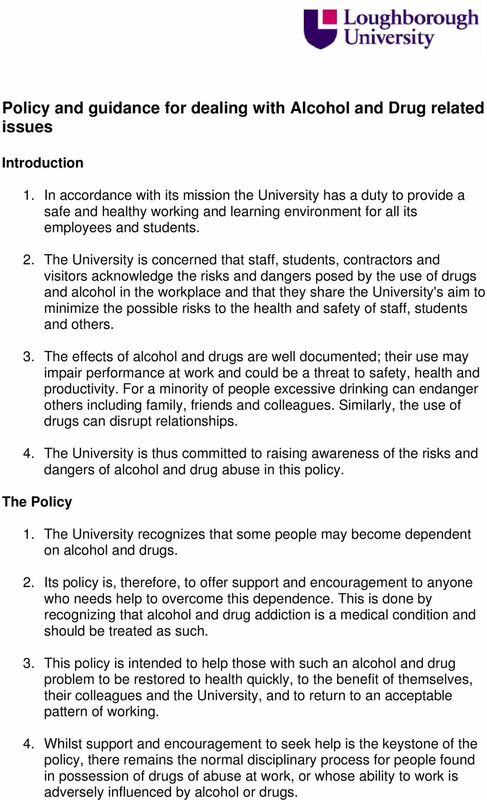 The University is concerned that staff, students, contractors and visitors acknowledge the risks and dangers posed by the use of drugs and alcohol in the workplace and that they share the University's aim to minimize the possible risks to the health and safety of staff, students and others. 3. The effects of alcohol and drugs are well documented; their use may impair performance at work and could be a threat to safety, health and productivity. For a minority of people excessive drinking can endanger others including family, friends and colleagues. Similarly, the use of drugs can disrupt relationships. 4. The University is thus committed to raising awareness of the risks and dangers of alcohol and drug abuse in this policy. The Policy 1. The University recognizes that some people may become dependent on alcohol and drugs. 2. Its policy is, therefore, to offer support and encouragement to anyone who needs help to overcome this dependence. This is done by recognizing that alcohol and drug addiction is a medical condition and should be treated as such. 3. This policy is intended to help those with such an alcohol and drug problem to be restored to health quickly, to the benefit of themselves, their colleagues and the University, and to return to an acceptable pattern of working. 4. Whilst support and encouragement to seek help is the keystone of the policy, there remains the normal disciplinary process for people found in possession of drugs of abuse at work, or whose ability to work is adversely influenced by alcohol or drugs. 3 employee's own doctor, or other medical specialist, with the prior agreement of the individual. 3. Training will be provided to all Managers and Supervisors to raise their awareness in identifying potential alcohol or drug problems and to recognize the signs of alcohol or drug abuse. 4. All managers and supervisors should consult Personnel Services or Occupational Health Services for information and advice on actions to take concerning employees who they think may have a drink or drugs related problem that may be contributing to impaired performance, sickness absence or increased safety risk. 5. 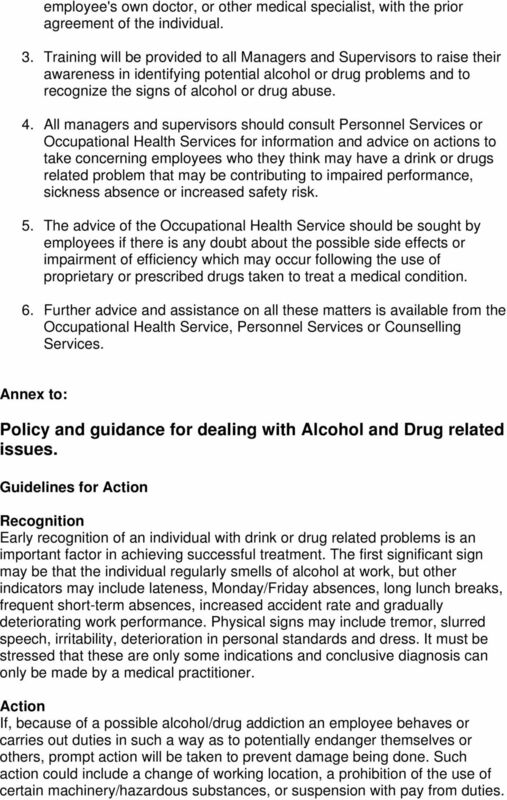 The advice of the Occupational Health Service should be sought by employees if there is any doubt about the possible side effects or impairment of efficiency which may occur following the use of proprietary or prescribed drugs taken to treat a medical condition. 6. Further advice and assistance on all these matters is available from the Occupational Health Service, Personnel Services or Counselling Services. 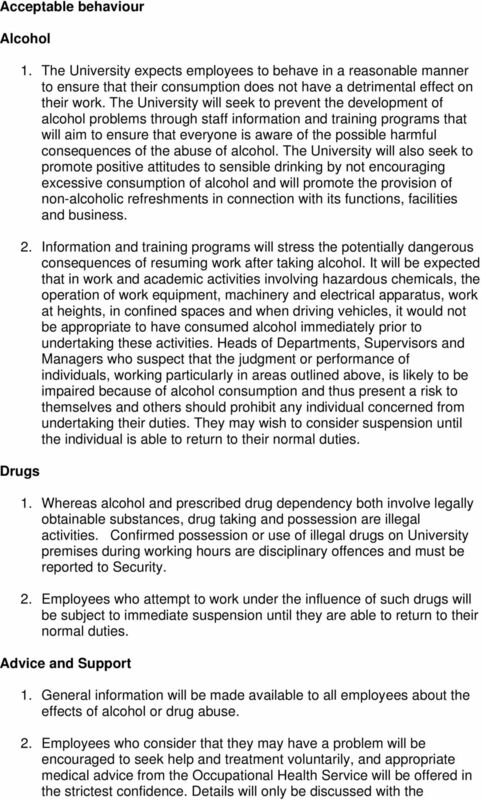 Annex to: Policy and guidance for dealing with Alcohol and Drug related issues. Guidelines for Action Recognition Early recognition of an individual with drink or drug related problems is an important factor in achieving successful treatment. The first significant sign may be that the individual regularly smells of alcohol at work, but other indicators may include lateness, Monday/Friday absences, long lunch breaks, frequent short-term absences, increased accident rate and gradually deteriorating work performance. Physical signs may include tremor, slurred speech, irritability, deterioration in personal standards and dress. It must be stressed that these are only some indications and conclusive diagnosis can only be made by a medical practitioner. Action If, because of a possible alcohol/drug addiction an employee behaves or carries out duties in such a way as to potentially endanger themselves or others, prompt action will be taken to prevent damage being done. Such action could include a change of working location, a prohibition of the use of certain machinery/hazardous substances, or suspension with pay from duties. 4 Assistance It is important to bear in mind that the over-riding objective of assistance is to secure the complete rehabilitation of the individual and their return to normal duties. The following actions are important in this regard. Employees who are identified as possibly experiencing alcohol/drug related problems, whether by observation, poor performance or conduct or by their own voluntary action, will be given the following assistance. 1. In cases of impaired performance initial discussion should be undertaken by the supervisor of Head of Department/Section or nominee to explore the possible causes. 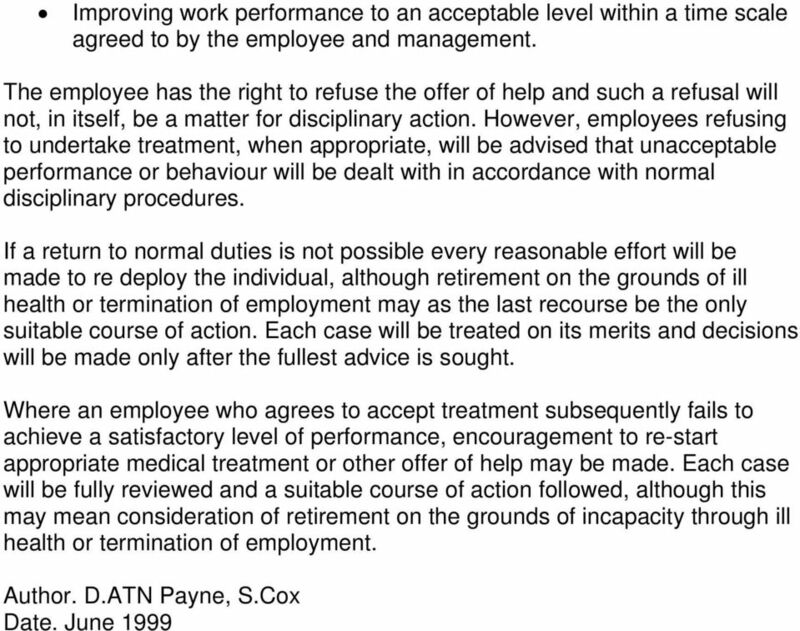 Further discussion may then be carried out by a Personnel Adviser in consultation with the Occupational Health Service, and the employee may be accompanied by a friend or Trades Union representative if they so wish. At the same time the individual will also have the opportunity to discuss the problem and should be advised that help is available from the Counselling Service and the Occupational Health Service to identify and treat the problem. 2. 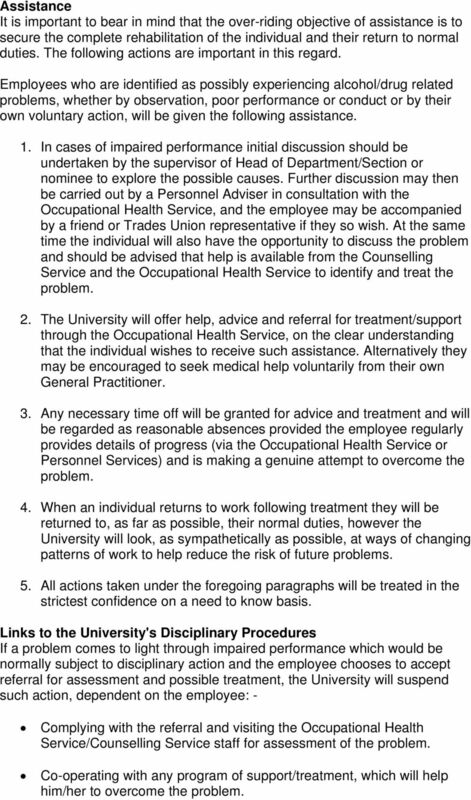 The University will offer help, advice and referral for treatment/support through the Occupational Health Service, on the clear understanding that the individual wishes to receive such assistance. Alternatively they may be encouraged to seek medical help voluntarily from their own General Practitioner. 3. Any necessary time off will be granted for advice and treatment and will be regarded as reasonable absences provided the employee regularly provides details of progress (via the Occupational Health Service or Personnel Services) and is making a genuine attempt to overcome the problem. 4. When an individual returns to work following treatment they will be returned to, as far as possible, their normal duties, however the University will look, as sympathetically as possible, at ways of changing patterns of work to help reduce the risk of future problems. 5. All actions taken under the foregoing paragraphs will be treated in the strictest confidence on a need to know basis. Links to the University's Disciplinary Procedures If a problem comes to light through impaired performance which would be normally subject to disciplinary action and the employee chooses to accept referral for assessment and possible treatment, the University will suspend such action, dependent on the employee: - Complying with the referral and visiting the Occupational Health Service/Counselling Service staff for assessment of the problem. Co-operating with any program of support/treatment, which will help him/her to overcome the problem. This Alcohol and Drug Abuse Policy is the policy and procedure jointly agreed between the North Tyneside Council and its constituent trade unions. Do not jump to conclusions or moralise. Provide information on support agencies. DEVELOPING AN Alcohol and Drug Policy FOR YOUR WORKPLACE 1. introduction THROUGHOUT EUROPE, ALCOHOL AND OTHER DRUG PROBLEMS IN THE WORKPLACE ARE A MAJOR FACTOR IN ACCIDENTS, ABSENTEEISM AND REDUCED PRODUCTIVITY. DRUG AND ALCOHOL ABUSE POLICY St Mary Magdalene Academy is a Christian community of learning. We aim to nurture young people to become high achievers and to discover their vocation in the global society. Any modification to this policy must be approved by the country Manager and Vice-President, Human Resources. Drug and Alcohol-Free Workplace Subcontractor Subcontract No. WSAP Program Manager (UT-Battelle Subcontract Number) (Subcontractor WSAP Program Manager) Program Manager Contact Info (Email & Phone) 1.
International Students House Health and Absence Management Policy PURPOSE International Students House accepts that employees will, on occasions, find themselves unable to attend work due to sickness.